Above is the holotype of ‘Meganthropus palaeojavanicus’, a right mandibular fragment from Sangiran. 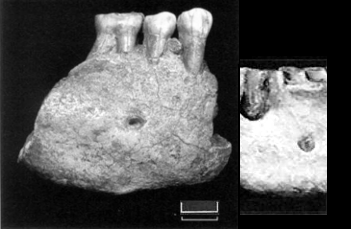 Thanks to the presence of a first molar, two premolars, and a scale bar, it should be possible to compare this ur-‘Meganthropus’ to lesser anthropoids. As for who to compare it with, I’ll somewhat arbitrarily nominate Dolní Věstonice XVI, remains that are regarded as “fully modern Homo sapiens” (Schwartz & Tattersall 2002). This male individual is estimated to have weighed 76 kg and with a maximum femur length of 47.1 cm (Trinkaus & Ruff 2012) they likely stood 176 cm (Feldesman et al. 1990). Sangiran 6 vs. Dolní Věstonice XVI from Schwartz & Tattersall (2002). The latter remains have been cropped to show a similar section as Sangiran 6. The scale bar has been moved over that of Sangiran 6 to assure myself I didn’t mess up too bad. The mandibular corpus of Sangiran 6 is about 140% taller than that of DV 16, so we can safely conclude ‘Meganthropus’ had a standing height of 246 cm and weighed 209 kg… is what I would be saying if there was any reason to suspect ‘Meganthropus’ had modern-ish human proportions that scaled up in a perfectly linear fashion. 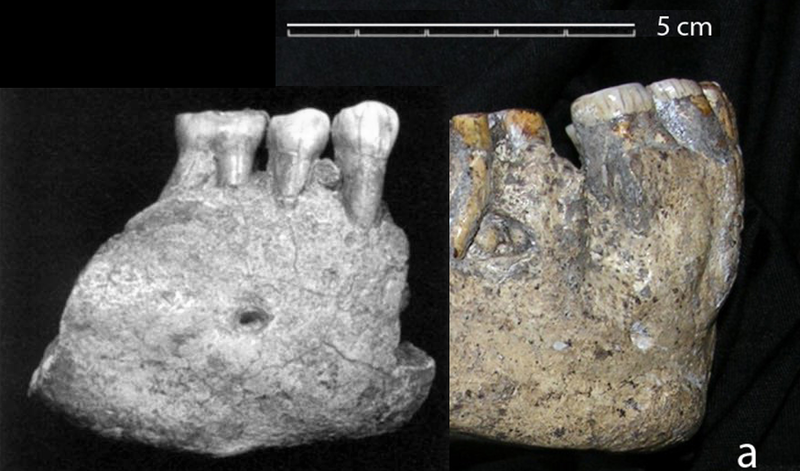 Mandibular corpus height appears to be an atrociously poor indicator of standing height and it can’t be ruled out that the owner of Sangiran 6 was substantially shorter than DV 16. Wait, what? Sangiran 6 and D2600 from Bermúdez de Castro et al. (2014). Ditto. I aligned these specimens by their first molars, which are nearly identical in size. D2600 is the mandible of Dmanisi Skull 5, which is affiliated with postcranial remains belonging to an individual estimated to stand 146 to 166 cm and weight 47 to 50 kg (Lordkipanidze et al. 2013; 2007). 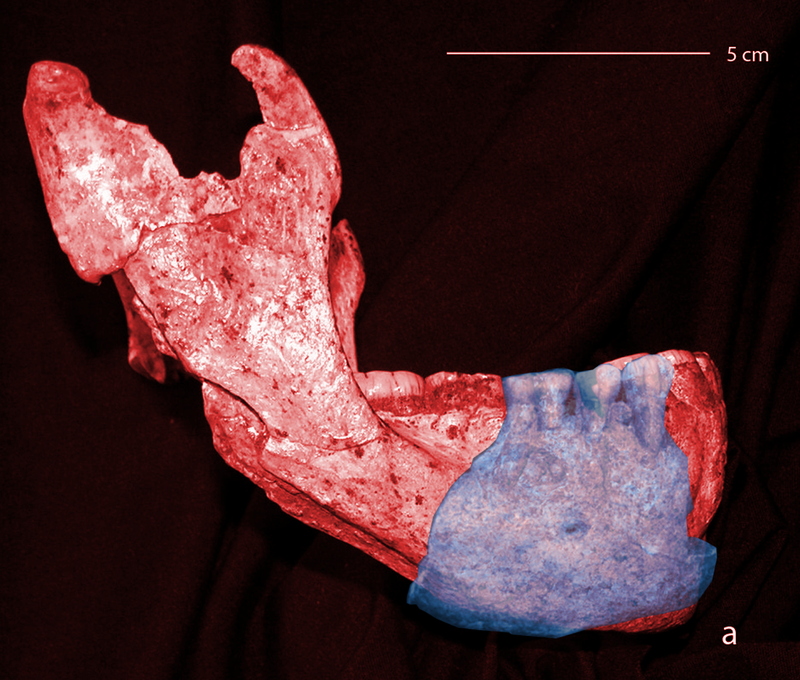 The authors interpret Skull 5 as having “close affinities” with early, large Trinil and Sangiran Homo erectus, although Sangiran 6 was not included in the analysis (Lordkipanidze et al. 2013) . Dammit. This is only a weblog written by a person with no obvious qualifications, so the firmest conclusion I can reach is that there’s no reason to conclude ‘Meganthropus’ had super-human height based only on mandible thickness. There are loomings that Sangiran 6 and other ‘Meganthropus’ specimens are early Homo erectus (or related chronospecies) with Dmanisi Skull 5-like robusticity (and presumed short stature), but this is entering circumstantial and controversial waters. *The possibility has been raised that Sangiran 6 had a pathology similar to leontiasis ossea, however, other early, robust Homo erectus should be investigated to see if it’s really an outlier. Feldesman, M. et al. (1990) Femur/stature ratio and estimates of stature in mid- and late-Pleistocene fossil hominids. American Journal of Physical Anthropology 83(3) 359–372. Lordkipanidze, D. et al. (2013) A Complete Skull from Dmanisi, Georgia, and the Evolutionary Biology of Early Homo. Science 342 326–331. Lordkipanidze, D. et al. 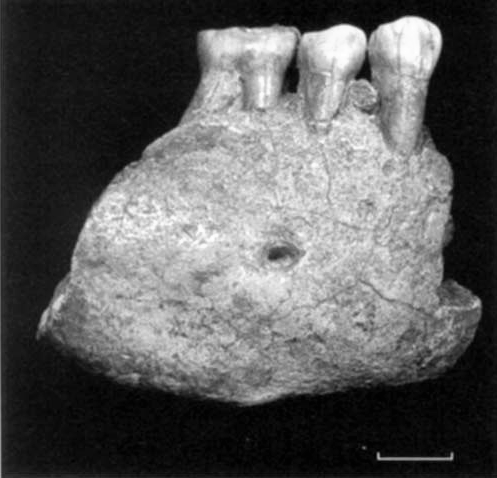 (2007) Postcranial evidence from early Homo from Dmanisi, Georgia. Nature 449, 305–310. Schwartz, J. & Tattersall, I. (2003) The Human Fossil Record. Volume Two. Craniodental Morphology of Genus Homo (Africa and Asia). Schwartz, J. & Tattersall I. (2002) The Human Fossil Record: Terminology and Craniodental Morphology of Genus Homo (Europe). As I’ve commented elsewhere, the possibility that Gigantopithecus may have been a bamboo specialist also raises the possibility of its molars being oversized. I don’t really know how the scaling on these things works, but for all the fuss that gets made over Gigantopithecus‘ giant molars, its incisors were smaller than a modern gorilla’s. In the third paragraph, I believe you mean 40% taller, or 140% of the height of, not 140% taller. How is a weight estimate like the one for DV 16 arrived at anyway? What’s the error bar? Why do you suppose academia is seemingly hesitant to push harder for answers concerning Meganthropus fossils when mega-fauna are everywhere in the fossil record? I think this feeds the conspiracy folks. Why wouldn’t more earnest scholars be clamoring to study and write about these apparent outliers from our past? Maybe, as L. Geekington’s analysis implies, there is simply too little fossil evidence to come to any conclusions.